I shared last week about my focus – one word, if you will – for the new year: RESCUED. The post was a peek into what has been on my mind. But, in reality, to be successful in adopting this change in perspective, I need to have some practical rhythms and behaviors. 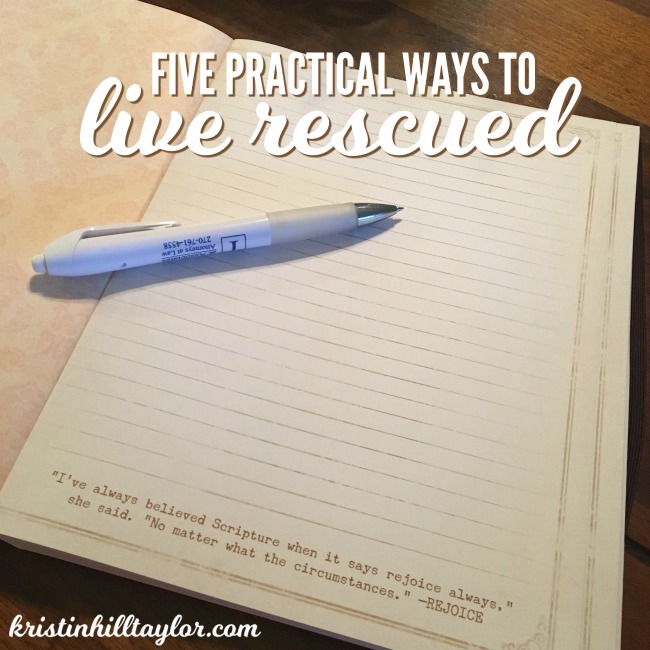 Obviously, your practical needs may look different than mine, but I wanted to share some of how I hope to live rescued. I have high expectations, and the reality is they aren’t usually met. Instead of shaming myself for not being more, I want to give myself grace that frees me to enjoy my real life. When I show grace to myself, it also becomes a more natural response to other people. 2. Make time for rest. I’m not a napper. But I like to read fiction, scrapbook on my phone, write, and watch TV. Those things are rest-filled for me because they take my mind off the lofty expectations of what all “needs” to be done. Often this means planning for white space on my calendar. We do quite a bit of this already – we often host our small group, invite friends over for dinner, and long to be the house where our kids’ friends want to come. But I want to be intentional about inviting people in when God puts them on my heart. It’s easy to say, “Life is busy, but let’s get together soon.” But it’s not hard to say, “Hey, do you want to meet us for dinner?” When we gather with others – whether it’s on our porch, around our table, or at a basketball game – our stories and lives become intertwined. 4. Say “yes” when I want to and “no” when I need to. I like to say yes to all good things and then get overwhelmed and decide to say no to everything. Reality rests in the middle. I need to be willing to say “yes” even when that means shuffling around what I thought my day would look like and recognize when “no” is necessary for the well-being of my own soul or my family. 5. Recognize strengths & weaknesses. Often the differences between me and my son frustrate me, but my counselor helped me realize his strengths are my weaknesses and my strengths are his weaknesses. Basically, we’re good for each other. I’ve known this in the eight years I’ve parented him, but the value of what we have to give each other in our daily lives really clicked recently. Ben and I are just one example. I want to be aware of my strengths, give God credit for creating me like He did, rest in His promises, and not worry about all the lies otherwise. If you’re new here, here are some posts to get you caught up: Brave doesn’t always mean big. Sanctified & Broken. Living Rescued. Living rescued is about bringing gospel truth to the forefront as a foundation for all other things. How can you do that in your own life this year? Kristin I love this!!! I have had to learn each of these too. What a great reminder today, friend. Thank you, Meg! I’m glad you could be encouraged. Such good truth! I can relate to where you’re at in so many ways. Learning to give myself grace has been such a journey, but so worth it! And rest time….thank you for saying you like TV! LOL I enjoy watching TV to escape all the needs that have pulled at me throughout the day (I think a lot of people do). But so often people won’t admit to liking TV. I don’t know why, but as silly as it sounds, I’m grateful you did! I just emailed you after I read the first day of your DWELL series. It’s such encouragement to me because it goes along with what God is doing in my life. I like TV – it’s such a mental break from EVERYTHING else. 🙂 I’m glad you’re here, Becky! Hi Kristin! It’s been great to connect with you in the In Bloom group on FB recently. I too need to show myself grace daily. I also struggle with high expectations, probably even higher than what God expects of me. Learning to treat myself better in 2018 is one of my goals. Blessings to you! Yes, I always love when the internet provides new ways to connect with familiar people. Plus I’m excited about that book! Oh, yes, I know the feeling of much-too-high expectations. God’s been shifting that perspective in me, and it’s been a long process but one for which I’m so grateful. Thanks for being here, Sarah! Oh, this is so good, and I’m glad you took time to really flesh out the practical meaning of living rescued and how it looks here on the ground. You’re making me think I should do that with my word for 2018: Orthodoxy. Hmmm . . .
Well, I’m glad I made you think. 🙂 Let me know what you come up with! All very good practices! And ones we often need to be reminded of. I know I need to remind myself! Thanks for being here, Barbara! Oh how I like your lists of practices and that they are in a list format. Yes, to grace!! a worthy list for all of us! Thanks for being here, Sue! I love how you wrote out your intentions for your word. I am still working on my word. I know the concept God has in mind, but I can’t quite formulate a word or group of words to explain it. However, with defining it as you did, I think I might just have it. Oh that’s great! Let me know what your word is when you get it. I’m excited to see what you and God come up with. It took me awhile to get ONE WORD for all the thoughts in my head, so I totally understand. Thanks for being here, Maree!